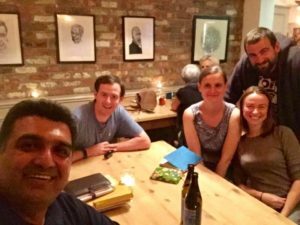 Want to know what we’re all about – read more on the About us page. 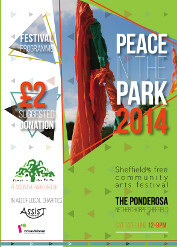 Love Peace in the park, then we need your help ..
we have £4k to raise in 3 weeks . A massive thank you,to all who have helped in the work of peace and put the festival together to make it ana amazing success. Great to see over 10000 people there . 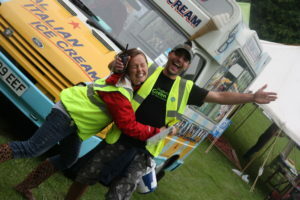 Peace in the park is totally run by volunteers. 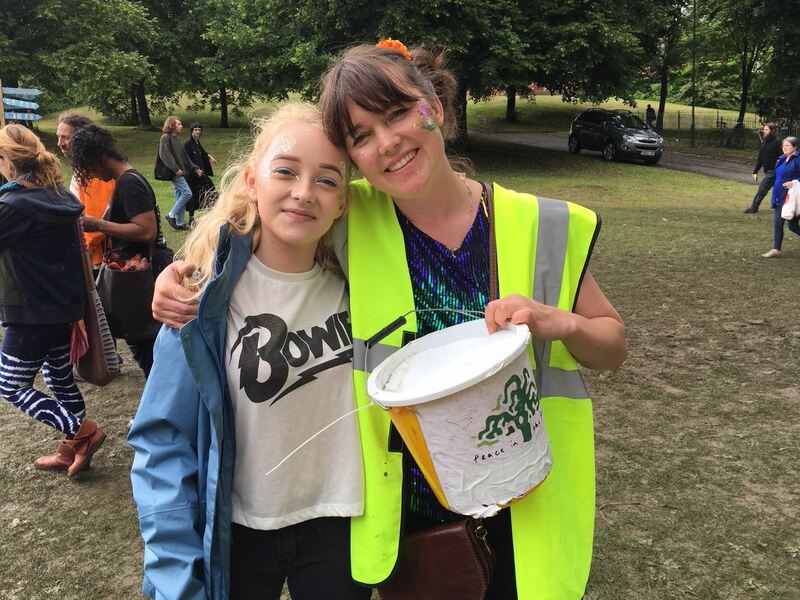 “I was involved in Peace in the Park in its very first year in 2003, and have helped in some way for most of the years it has happened. Be it face-painting, collecting money on the day, postering, raising money in advance through fundraisers, organising stalls or campaign speakers for the stages on the day. I love the festival as it reminds me that there is a huge and loud beating heart of peaceful people in Sheffield. It has been amazing to meet and work with people who also believe a different world is possible, and who are up for throwing their energy, imaginations and a whole lot of time into the mix to produce an awesome day for soooo many people. I love festivals and dancing too. For me, peace is people being kind to each other, in short. It’s standing up to the corporations and governments who are destroying innocent lives and profiting from war. It’s looking after the Earth and its resources, so the incredible natural wonders of the world can continue to exist peacefully, free from harm. Thanks to all those who gave to “the Grow your Tenner campaign” on LocalGiving. It may have finished but you can still Give. Is marketing, fundraising, art work , graffiti,waste management, message for peace your thing. 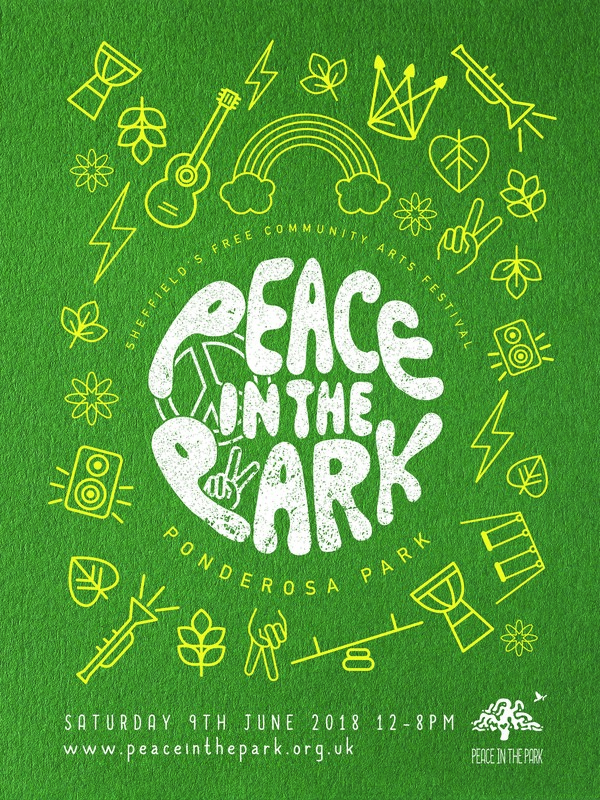 Do you Love Peace in the Park? 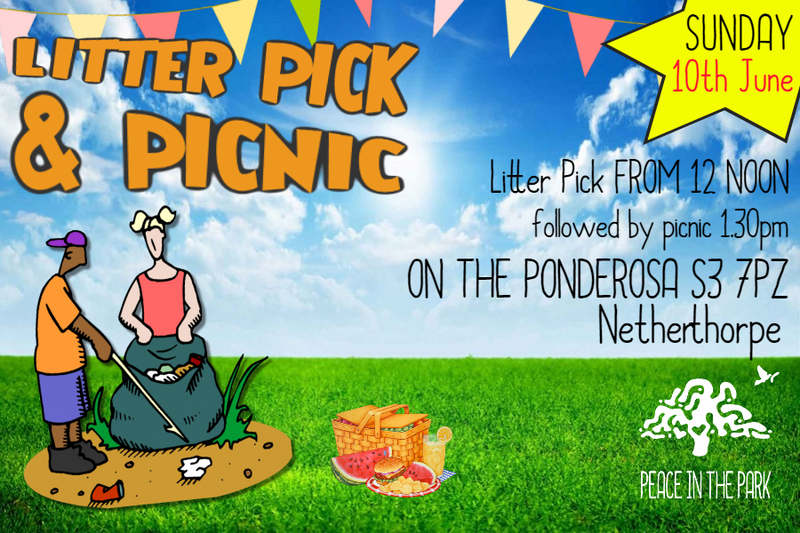 Want to make sure we have a festival next year? A Massive Thank you to all who halp make 2017 festival a success and who have partnered with us in the coming year.. 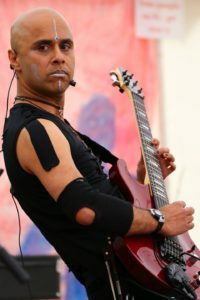 Thanks to Dean Stead Photography Kinder Kalsi and Nelly Naylor Photography for there shots of the day…. If you can help the manifesto become reality let us know so we can partner with you. Whether you have loads of time to spare and want to give something back to the community or whether you can only spare a few hours on the big day itself, we want to hear from you! Hello Sheffield! Did you enjoy the festival? The venue was the same as last time; the Ponderosa, Netherthorpe, Sheffield (map). Look out for next year’s date and why not see how you could get involved in making this year’s event even better! 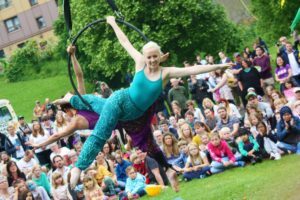 You can get to Peace in the Park by tram, bus or a short walk from town – please don’t bring your car if you can avoid it (there is very little parking near the park). Read more about the ways we’re helping the sustainability of the festival and see how you can help with this. 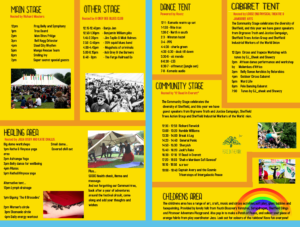 Full details in the festival programme, downloadable on the left, or available on the day (with any donations given in going to our supported charities). Please note there will be drinking water and toilets provided for you on site also. Hope to make it down on the day but if not have a wicked day and well done on your 8th year ! hi im interested in getting involved? 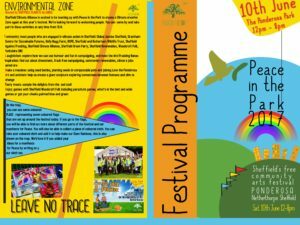 If you want to help on the day, then, despite it being very close to the event, stewards@peaceinthepark.org.uk would love to hear from you. 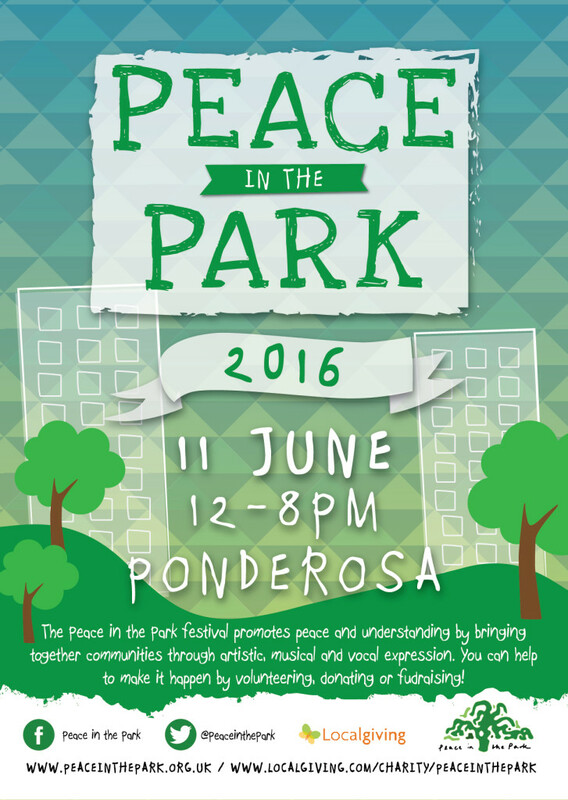 If it is a stall, then stalls@peaceinthepark.org.uk is what you want (but note that there is very little space left at this late stage). cant wait I loved it last year ! Glad to hear that the festival is being held down my neck o’ the woods. Some of the music played at the last one was absolutely amazing. Gawd bless yah Peace in the Parkers!